NORMAN MAPEZA’S wife, Blandina, is thankful to God for one big thing. 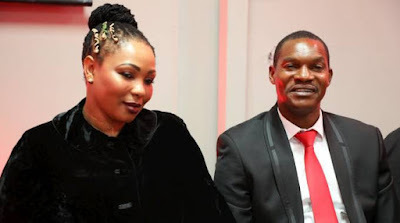 That her husband, who was crowned the 2018 Castle Lager Premier Soccer League Coach of the Year last Friday night, rarely loses matches. Blandina sat by her husband’s side at a glittering Soccer Star of the Year banquet held at a Harare hotel and was all smiles when Mapeza bagged his second consecutive Coach of the Year award. So animated is Mapeza on the touchline that one would presume Blandina has a tough time containing the gaffer at home, especially when he loses a match. Luckily, she rarely welcomes home a losing husband. “Thank God he (Mapeza) hardly loses,” said Blandina, before breaking into laughter. A season that began with a setback for Mapeza who endured a painful back surgery in March closed in style for the revered gaffer who guided FC Platinum to a second consecutive league title. Pure Platinum Play lost four times in 34 games, scoring 52 goals against 14 as Mapeza’s mean machine marched on to a memorable feat. A man who spends most of his time reading about football, a disciple of Pep Guardiola and Maurizio Sarri who doesn’t take losing lightly, one would think Mapeza should be a difficult husband to handle. But Blandina, who wore a black dress to complement her husband’s black suit, revealed the other side of Mapeza. “When you live in the same house with a great man in the football world, you know how it is, you also end up loving the game. “He (Mapeza) is so passionate about his game. When he comes home he talks a lot about football but usually he doesn’t bring home that vigour he shows on the touchline. “Just like any other wife, I support him. Sometimes we endure difficult times, you know how it is being a coach but we take it all in our stride,” she said. Mapeza has made it on football’s fast lane, achieving greatness both as a player and a coach but his sons Njabulo (15) and Sasha (12) have chosen different sporting paths. They are into cricket and rugby. “Our kids play other sports but they are very passionate about their dad’s game. “They are always enquiring about his progress on the field of play and they offer their dad maximum support,” revealed Blandina. Mapeza has transformed FC Platinum into a formidable force since taking over from Lloyd Mutasa in August 2014. The former Warriors skipper has taken charge of 138 league games, winning 83, drawing 39 and losing 16. During that same period, Mapeza has amassed 288 points out of a possible 414, which translates to a 70 percent success rate. FC Platinum have 84 clean sheets in 138 games, they have scored 194 goals and conceded 71 times since Mapeza’s first league game in charge – a 1-0 win over Black Rhinos on August 20, 2014. Mapeza has built a mean machine that is so ruthless at fortress Mandava where FC Platinum have suffered just four losses in the 69 league matches they have played in Zvishavane since the revered gaffer took charge. “It’s all about hard work, we keep pushing. Thanks to the FC Platinum executive, the fans, fellow coaches and journalists. “I wish all of them a good festive season,” said Mapeza. The gaffer spoke glowingly about his wife. “She is very supportive, I can’t even express how supportive she has been. You know how my season started with a back injury, she was always there for me, urging me on.